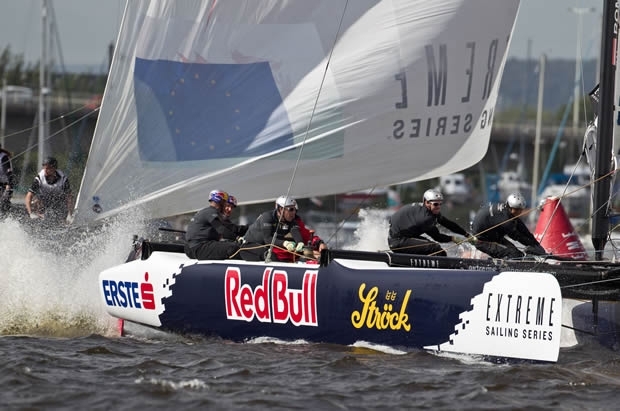 The forecast for the second day of Extreme Sailing Series racing in Cardiff was for lighter winds, but the breeze over-delivered again on Cardiff Bay. If the increase in wind pressure was unexpected, the pressure on the teams as they battled for their position on the leaderboard was exactly as anticipated. The nine boats fought tooth and nail for the best position off the start line and gave no quarter in the close racing that unfolded in front of the public and VIP guests. Eight races in total were staged on day two and, once again, good starts and slick boat handling were key to success in the gusty conditions – the French team Groupe Edmond de Rothschild came very close to capsizing at the downwind bearaway mark in the sixth race of the day, but escaped unscathed, although the onboard cameraman only just managed to hang on (see today’s Race of the Day below). The eight races produced six different winners including Alinghi, GAC Pindar and Groupe Edmond de Rothschild. “If we had more space to play, the wind would not be so much of a problem as we are finding in such a small and constrained environment,” said Alinghi skipper, Ernesto Bertarelli. For the local entry, Team Wales backed by the King of Shaves, which enjoyed the support of the home crowd, the biggest cheer came in the first race when they led the fleet around the tight race course, only being overhauled by Red Bull Sailing Team in the final phase of the race. This came after their boat was repaired overnight after dismasting on Thursday's final race. “The circuit style racing is not what we are used to, but it’s great,” said skipper Dave Evans, who at 26 is the youngest skipper in the fleet here in Cardiff. “Friends and family are down watching, and everyone seems to have a smile on their face. All of us have done our individual sailing, so when we knew our jobs it was a case of just communicating it. The communication sounds easy to do, but actually it is the hardest bit in sailing I think!" The pace of the Extreme 40 racing is unforgiving, each race lasting just 10 minutes or so, with a few minutes rest in between, then it is full on physicality for the five crew as they throw their 40-foot speed machines around the tight, demanding courses. “It’s all pretty frantic at the front, but it’s been great!” agreed 470 silver medalist Hannah Mills who is the floater on board the Welsh flagged Extreme 40. “The fleet is generally having a right-old battle. It’s just wicked racing – so close and so short, and so exciting all the time." Tomorrow’s forecast is for 15 knots but don’t be surprised if there is more – it has been the case so far and there will be no respite for the racing crews going into the penultimate day of racingin Cardiff.